Black Diamond HoodWire Quickdraw. Lightweight, easy-clipping setup, with snag-free wiregate HoodWire carabiners on the top and bottom. 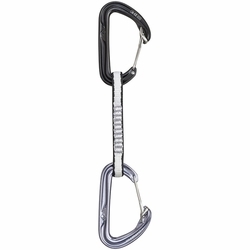 With hot-forged HoodWire carabiners on the top and bottom, the Black Diamond HoodWire Quickdraw fuses keylock performance with wiregate functionality. From overhanging clip-ups to frigid alpine ridges, the HoodWire biner's metal hood eliminates snags when cleaning, and the wiregate design lowers the weight and resists freezing in winter conditions. The 12 mm Dynex™ dogbone provides a light, durable connection, and the Straitjacket™ insert ensures the bottom biner stays in the optimal clipping position.